Taiwan is the fulcrum of the rivalry between China and the United States. Yes, issues like trade and technology are crucial. But when it comes to security, geopolitics, and global leadership (both moral and political), Taiwan's future—its strength, its sovereignty, its form of government—is paramount. And tensions over the island are only rising. On Sunday, two Chinese J-11 fighter jets crossed the Taiwan Strait's median line, the de facto maritime border between China and Taiwan. In response, the Taiwanese military scrambled fighter planes to intercept the Chinese jets, which continued their incursion for about 10 minutes. "It was an intentional, reckless, and provocative action," Taiwan's Ministry of Foreign Affairs said of the incident. "We've informed regional partners and condemn China for such behavior." Taiwanese President Tsai Ing-wen called for the "forceful expulsion" of Chinese warplanes next time they cross the median line. The standoff marks one of the most serious Chinese incursions across the maritime border in 20 years. Chinese jets flew across the line frequently until 1999, when China and Taiwan reached a tacit agreement to stop the practice. Since then, there have been rare Chinese incursions, which have largely been considered accidents, including the last such incident in 2011. Sunday's provocation, which appears to be intentional, is the latest sign of increased Chinese pressure on Taiwan. In recent years, China has tried to squeeze Taipei economically and diplomatically through various means—inducing countries to sever relations with the island, forcing Taiwan out of international organizations like the World Health Organization, and more. China is also prepared to use its military to pressure the island. In a report released in January, the Defense Intelligence Agency identifies Beijing's desire to "compel Taiwan's reunification with the mainland and deter any attempt by Taiwan to declare independence" as the "primary driver for China's military modernization." Recently, Chinese President Xi Jinping has expressed a willingness to use his country's military might against Taiwan. "China must be, and will be reunified," he said in a speech in January. "We do not forsake the use of force." With its incursion on Sunday, perhaps China wants to test Taiwan's response and see how far it can go with such provocations. The situation in the Taiwan Strait is also a test for President Trump. For decades, the U.S. has pursued a delicate policy: deter China from attacking Taiwan, while reassuring Beijing that Washington will not accept Taiwanese independence—in other words, maintain the status quo. But China's military posture toward Taiwan has only grown more aggressive, and Chinese leaders are not giving up on reunification, not for one second. Indeed, China seems to believe that the U.S. will sit by as Beijing has its way with Taipei. So how will the U.S. respond? Last week, the U.S. Navy sailed a missile-guided destroyer and a Coast Guard cutter through the Taiwan Strait for the third month in a row, to ensure that vessels can navigate freely through the waterway. The operations are clearly messages to China, which claims the strait as its own and has adamantly opposed the moves with strong condemnations. Such operations are necessary and important, but far from sufficient. Trump can take additional steps to assure Taiwan of America's commitment to the island's democracy, free of Chinese rule, and to deter China from using force to compel reunification. The most obvious step is to expedite Taiwan's request to buy F-16V fighter jets from the United States. Tsai confirmed Taiwan's request during a speech in Hawaii last week. The looming sale of course angers Beijing, but the Trump administration must approve the sale, to bolster Taiwan's military capabilities, which are far less formidable than China's, especially in the air. Trump should also order his State Department to launch a concerted effort with America's allies in Asia to present a more united front against China's bullying against Taiwan. Washington will have some receptive audiences—Japan, for example, shares Taiwan's concerns about Chinese aggression in the western Pacific. Of course the U.S. does not want to be too aggressive and provoke a war with China over Taiwan, but Washington must push back and establish a more robust posture of deterrence. America's interest in Taiwan goes beyond a moral belief in freedom and democracy overcoming ruthless oppression. If the U.S. were to abandon Taiwan in the event of a Chinese attack, it would signal to the rest of Washington's allies in Asia—and even in Europe and the Middle East—that they could not count on American guarantees. Indeed, they would look elsewhere for security, and the American network of allies, which gives the U.S. unparalleled global power, could very well collapse. 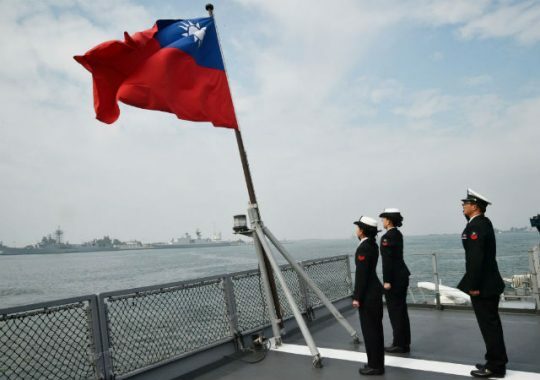 But even beyond morality and allies, Taiwan is the critical point of the so-called "first island chain," the first line of archipelagos off the east Asian continental coastline. In order for China to challenge American dominance in the Pacific, it would need to break through that chain, which is composed of American allies. For China, Taiwan is the spot where it can break through. So if the U.S. is concerned about Chinese ambitions, or about the world order that has brought so much global prosperity, it must be willing to defend Taiwan, hoping that day never comes. China is banking on an asymmetry of stakes, meaning that, in a conflict over Taiwan, while the United States may have important interests at stake, they are not as important as the interests that China has at stake. For Chinese leaders, beyond projecting its power into the Pacific, reunifying Taiwan is about their regime surviving. How can the Communist Party rule with any legitimacy and promote its model of governance when a tiny island can prosper just a few miles away as an independent democracy? The U.S. may be fighting for important interests, but not for the survival and legitimacy of the American government. Trump can take actions now to alter China's thinking, to deter Xi and assure the Taiwanese. There is no time to waste. This entry was posted in National Security and tagged China, Military, President Trump, Taiwan. Bookmark the permalink.